It was for the 1st time that a US nuclear submarine came to Jeju . Still, there was no prior media report about the entry of US nuclear submarine into the Jeju navy base which means even the media reporters could get the news at the last minutes. It was peace activists in Gangjeong who discovered it first. And strangely, there was not a TV broadcasting company in the press conference on Nov. 23, which is unusual. 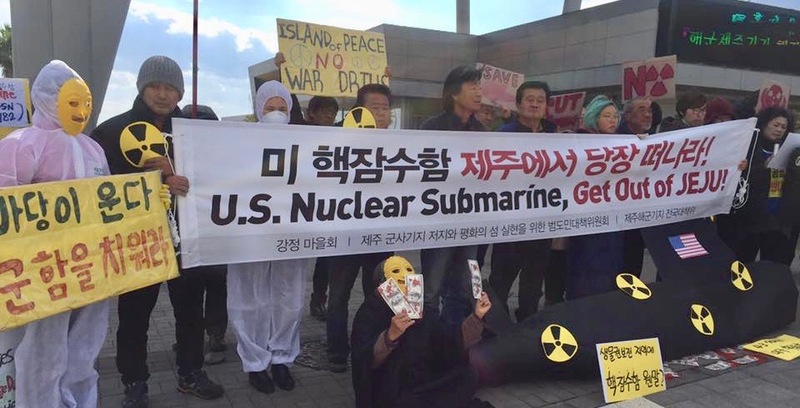 We suspect that the navy is really trying to hide the fact of the entry of US nuclear submarine into the Jeju navy base from the eyes of Island people and the world! WHY! The SSN Mississippi (SSN-782) which entered the Jeju navy base at 10am, Nov. 22 and is known to leave next week is a quite an offensive arm which can penetrate close to the coast of so called enemy country and destroy its big cities in 2 -3 minutes with its 12 Tomahawk cruise missiles and torpedo. It has attacked Iraq, Afghanistan, Kosovo etc. And known to be one of the most threatening arms to North Korea. It is told to have left Yokohama US base, Japan on Nov. 10 and joined a war exercise near the Jeju sea before coming to Jeju! North Korea has carried out nuclear tests 6 times since 2006. The government of George Bush Jr had targeted North Korea as one of seven countries in its Nuclear Posture Review. And the US and South Korean militaries have conducted war exercises which includes the scenario of preemptive strike against it and decapitation of its leadership.The joint declaration has already been broken. Still it is important for South Korea not to arm itself with nuclear since non-nulclearization of the Korean Peninsula is a necessary premise for peaceful unification of Korea. It that sense, the agreement by Presidents Moon Jae-in and Trump to introduce military strategic assets which include acquirement of nuclear submarine by South Korea was already regrettable. US nuclear submarines have entered the naval ports of Jinhae and Busan in the south of Korean peninsula for more than 10 years with accidents not well known to the public. However, the significance of Jeju navy base is in its geopolitical location. It is closer to China and was built to ‘ protect southern sea lane.’ which means the ‘South Korean’ base was primarily built to contain China, on behalf of US Strategic flexibility policy. That is why the visits by US nuclear submarine or any further strategic assets to the Jeju navy base is threat to the stabilization and peace of the region. We have resisted long time to stop the construction of the Jeju navy base because it would greatly destabilize so endanger the peace of the region. And what about the UNESCO-designated soft corals, dolphins and other unspeakable lives? How about the possibility of radiations? Who get profits from this endless war exercises and military buildup? US Nuclear submarine out of Jeju! Close the Jeju navy base! Stop the militarization of Jeju! Jeju is not for a garbage and radiation dumping ground by foreign militaries! (left on June 20)–> The ship had to unexpectedly leave the port around 6 pm on the same day, cancelling its participation in a joint war exercise with Canada and South Korea, because of discovery of damage in its equipment. Its departure was 10 hours after its docking into the base.